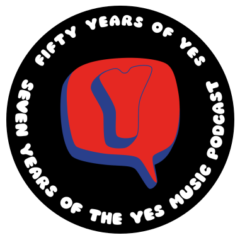 The twenty-second episode of the Yes Music Podcast all about changes in personnel. Are Yes band personnel changes evolution or revolution? Is it more difficult to replace a singer than an instrumentalist? What does the future hold for personnel? I also called Peter Banks, Tony Banks, thus mixing him up with Tony Kaye – I must be more careful! Sorry! Thanks, Paul. I was really nervous about this episode – but I think when I re-listened to it myself that I agree with you about the flow being quite good. I’m thinking of having sections of this kind of thing mixed in with other segments – we will see! Thanks so much as always for taking the time to comment! Like Paul, I thought this week’s podcast flowed well – even with notes it’s not an easy job to do this unscripted. Well done. With all the previous podcasts, where you’ve made points with which I disagree, I’ve been happy simply to accept we have differing opinions, but this time I’m moved to discuss your comments further. I think you’ve (possibly deliberately) oversimplified the distinction between “evolutionary” and “revolotionary” changes. I would certainly put Steve Howe in the revolutionary bracket. His arrival moved the band in a very different direction and he even arrived with, if not his own songs, certainly parts – Wurm appears in an earlier guise on the Bodast album, as does one of the themes from Close to the Edge. It is almost certain that without this change, Atlantic would have dropped Yes, at least according to Chris Welch’s biography. One could also make the case for Rick Wakemen’s introduction of synthesisers being revolutionary. So, I don’t think changes in personell are either revolutionary or evolutionary – by their very nature they are all part of the evolution of the band but some may “revolutionise” the sound/material more than others. Thanks for the comment. Interesting to hear about Steve Howe! You are, of course, right about the over-simplification which is probably necessary for the length of the episode 😉 I’m very glad it prompted you to comment! Thanks again.